The first book in the Circle Universe is Sandry's Book, and although she is a main character. She isn't THE main character. The way Tamora has written the first two series in the Circle Universe means that each book has a main hero; who the book is typically named after. So with this book being named after Sandry, it means that she will be the main hero. Since this book is written for the Young Adult audience it's not as complex or as deep as most of the books I read these days. But I've grown up reading Tamora Pierce and I just love how she writes her stories. In this case I could feel the despair, anger and confusion that Sandry, Daja, Tris and Briar feel as they are found by Niklaren Goldeye. Then as they try to find their places in their new world. Since I wasn't much older (I think a yr or two?) than they were when I first read these books, I could really relate to the emotional turmoil they were going through. For me, my school friendship group was changing. And since I'm not very good socially (and neither are these 4) this was a bit stressful for me. But with the help of constantly reading Tamora's books in those few years (see evidence below if you don't believe me about how many times I read these books) I managed to get through it. And I even discovered some other people who liked reading, and who even liked Tamora Pierce as well! That was a bit of a turning point for me when I realised I had something else in common with others. Which actually seems hard to believe since I'd already spent the last 6-7 years with most of them by that point in time. So I have a few different fav parts, I mean, these characters and their stories are written in such a great way that you can't help but have a few parts of the book you just can't wait to read again! Ok, so my all time fav is when Sandry pulls rank on some snobby noble girl (Sandry's family is like upper upper upper echelon of society and only the people actually ruling a few different countries rank higher than her) to get Daja a seat when Daja first arrives and doesn't know where to sit in the dining hall. A girl nearby muttered, "If that's a lady, I'm a cat." Reaching out, Sandry lifted the pitcher of milk from the table. Cradling it in both hands, she walked over to the mutterer. "I am Sandrilene fa Toren, daughter of Count Mattin fer Toren and his countess, Amiliane fa Landreg. I am the great-niece of his grace, Duke Vedris of this realm of Emelan, and cousin of her Imperial Highness, Empress Berenene of the Namorn Empire. You are Esmelle ei Pragin, daughter of Baron Witten en Pragin and his lady Colledia of House Wheelwright, a merchant house. If I tell you my friend is a lady, then you"- carefully she poured milk into Esmelle's plate-"you had best start lapping, kitty." She set the pitcher down and returned to her chair. Being someone who HATES bullies and will actively fight back I practically bounce in my seat with glee every time I read that bit. It's just so hilarious and it just sets the tone for Sandry's personality in a way no other quote can quite grasp. Thank you for reading and next week I'll have the next book (Tris's Book) up next week! 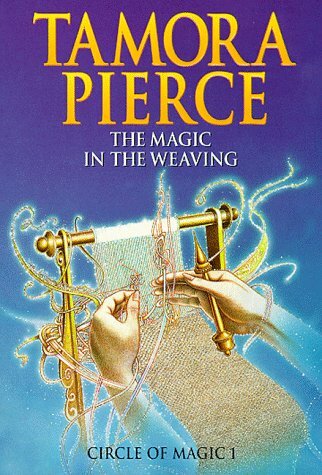 Tamora Pierce is one of my favorite authors and inspired me to be a writer! Have you read her Tortall universe? The Wild Magic series in my favorite!